'Murano Glass' is a term recognised around the world as a type of glass made on the island of Murano, situated in the Venetian Lagoon, about 1.5 kilometres north of Venice. Although a lot smaller, it is similar to Venice in that the island is a series of small islands linked by bridges. Using original designs and a mixture of traditional glass making techniques, we offer a wide range of contemporary Murano Glass jewellery that represents the very best of Murano Glass production. Vivid colours, swirling, hypnotic patterns and a wide range of exciting designs are the qualities that make Murano Glass jewellery unique. Our Murano Glass jewellery collection contain a mixture of Murano Glass necklaces in various styles and sizes as well as pendants, bracelets and earrings. We have indicated where these murano glass products are available in a matching style. Murano glass necklaces come in an amazing array of styles, bead shapes, lengths and colours. They range from short strings of perfectly round beads, all of the same colour, to a long strand of beads made up of a mixture of shapes, sizes and colours. The majority of Murano glass necklaces are single strand, but there are also double stranded, and sometimes even triple and multi-stranded strings of beads. The glass beads themselves can be anything from a tiny 'seed bead' to a large, rectangular bead or a triangular chunk. Sometimes they are close together, often interspersed with a smaller glass bead, and another popular style is to have the beads spread out thinly along the chain which gives an impression of them floating around your neck. The chains can be silver, gold, coated metal or thread. We have a wide range of murano glass necklaces that make perfect Murano Glass gifts. Some are beautifully simple and others are lavishly complicated. It is a range of Murano Glass jewellery to suit all tastes! Whether you are looking for Murano Glass gifts to give a loved one, or simply looking to spoil yourself, you will certainly find many beautiful pieces of original, authentic, hand-made, Murano Glass jewellery within 'The Italian Shop'. Murano glass pendants are one of the most popular pieces of Murano Glass jewellery. Pendants are usually a single bead of Murano glass on the end of a chain, metal cord, braided leather or cloth cord. The Murano bead can simply be a traditional round glass ball, a Murano glass heart, a flat Murano bead of a teardrop or heart shape, or a large, multi-coloured bead which has been sculpted with amazing shades of Murano glass. Murano Glass pendants come in a fabulous variety of different shapes, sizes and designs. Murano Glass earrings make delightful but inexpensive gifts. Murano glass earrings do not tend to be small, and generally consist of a single bead hanging from hypoallergenic, anti-tarnish hooks. The single Murano glass bead is usually topped with one or two contrasting glass beads and a stopper. Sometimes the Murano beads are of a different shape and the earrings a little longer and sometimes the single bead is moulded, giving a 3D effect. There are other styles of Murano glass earrings, including multi-stranded, single bead stud earrings and long strings of smaller beads. 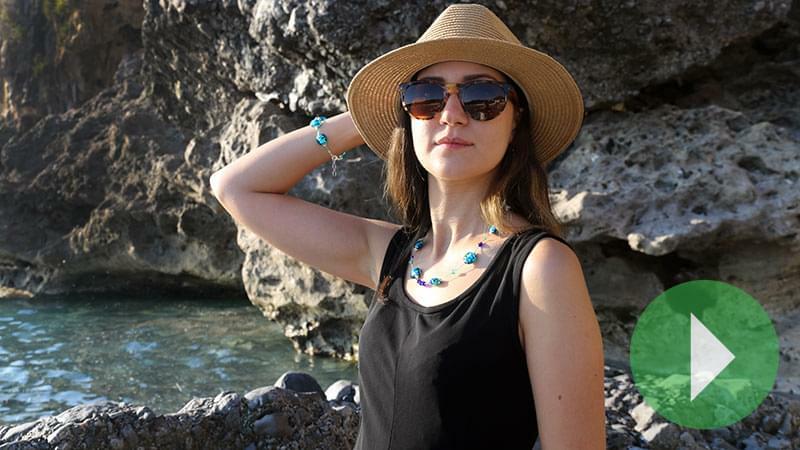 If you are looking for something a little more extravagant, browse through our range of necklaces, or perhaps consider a set chosen from matching murano glass necklaces, murano glass pendants, Murano glass bracelets and Murano Glass earrings. As with the necklaces, the Murano glass bracelets come in endless styles, colours and bead configurations. The only thing that does not change is the size, they all tend to be roughly the same length but most have a small length of chain at the clasp which makes the bracelet adjustable. More often than not, the chain will have a tiny bead hanging from the end of it which is a very pretty touch. Some bracelets, particularly the ones matching Murano glass pendants, will have just a single bead with stoppers on either side. In addition to our jewellery ranges, we also offer a range of attractive Murano Glass objects, such as bottle openers and wine bottle stops. When people talk about Murano glass Gifts, we all immediately think of extravagent bowls, huge sculputures and sets of expensive wine glasses. While these glass objects exist, and are very popular, particularly with collectors, there are Murano glass objects to suit all budgets. A simple wine bottle stopper with a large Murano blown glass ball on top is an affordable luxury. At the end of the 13th century all of the glass makers who were working in Venice were sent to the island of Murano as it was feared the furnaces would set fire to the wooden piles supporting the city. The Murano Glass makers were granted special status on the island. They were alowed to carry swords and were immune from prosecution by the Venetian state. The glass masters were even welcomed into marriage by the noble families of Venice. However, they were forbidden to leave the Republic, and sharing their glass making secrets with the outside world was punishable by death! By the end of the 16th century, the Murano Glassmakers accounted for nearly half of the island's population. The expert glass makers of Murano have been at the forefront of European glass making for centuries, refining techniques such as: crystalline glass; enamelled glass (known as smalto); golden glass (known as goldstone); multicolored glass (known as millefiori); milk glass (known as lattimo) as well as imitation gemstones made of glass. Murano Glass is highly individual and extremely beautiful and is still made by a handful of skilled artists who maintain their traditional, glass making production methods as closely guarded secrets. The popularity of Murano Glass is such that it is widely counterfeited and sold as genuine Murano Glass around the world. It is estimated that around 40% of the Murano Glass market now consists of immitations. Genuine pieces of Murano Glass can only be made on Murano and should always come with a certificate of authenticity. Necklaces Click here to browse through our collection of Murano Glass necklaces. Bracelets Click here to browse through our collection of Murano Glass bracelets. Earrings Click here to browse through our collection of Murano Glass earrings. Pendants Click here to browse through our collection of Murano Glass pendants.